Western blot analysis of whole cell lysates probed with PDIA1 antibody followed by detection with HRP conjugated Goat anti Mouse IgG antibody (1/10,000, STAR207P) and visualized on the ChemiDoc™ MP with 4 second exposure. Arrow points to PDIA1 (molecular weight 57 kDa). Mouse anti-human PDIA1 antibody recognizes protein disulfide-isomerase, also known as cellular thyroid hormone-binding protein, collagen prolyl 4-hydroxylase beta, glutathione-insulin transhydrogenase, p55, or procollagen-proline. Mouse anti Human PDIA1 antibody recognizes PDIA1, also known as cellular thyroid hormone-binding protein, collagen prolyl 4-hydroxylase beta, glutathione-insulin transhydrogenase, p55, procollagen-proline, 2-oxoglutarate 4-dioxygenase beta polypeptide or thyroid hormone-binding protein p55. The P4HB gene encodes the beta subunit of prolyl 4-hydroxylase, a highly abundant multifunctional enzyme that belongs to the protein disulfide isomerase family. When present as a tetramer consisting of two alpha and two beta subunits, this enzyme is involved in hydroxylation of prolyl residues in preprocollagen. This enzyme is also a disulfide isomerase containing two thioredoxin domains that catalyze the formation, breakage and rearrangement of disulfide bonds. Other known functions include its ability to act as a chaperone that inhibits aggregation of misfolded proteins in a concentration-dependent manner, its ability to bind thyroid hormone, its role in both the influx and efflux of S-nitrosothiol-bound nitric oxide, and its function as a subunit of the microsomal triglyceride transfer protein complex (provided by RefSeq, Jul 2008). 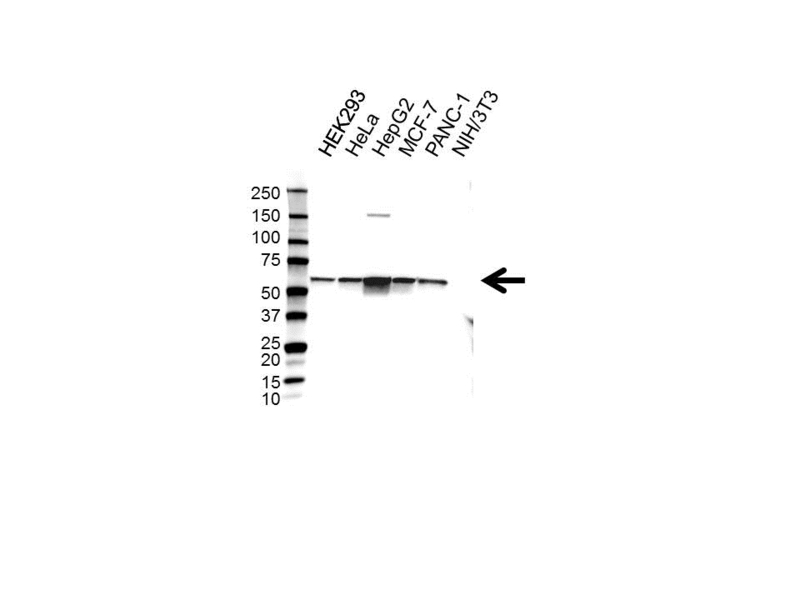 Mouse anti Human PDIA1 antibody detects a band of 57 kDa. The antibody has been extensively validated for western blotting using whole cell lysates.